Catalogue Number: Aircraft Number 193 - P-3 Orion in action by Richard S Dann and Rick Burgess. Advantages: 102 photos and 30 detailed line drawings; good breakdown of variants; helpful companion for modellers. This new publication from Squadron Signal is laid out in the typical style that is the trademark of this publisher. The story starts with the L-188 Lockheed Electra and the transition to the P-3A Orion. A few pages are dedicated to the P-3B but the bulk of the publication is dedicated to the P-3C and its derivatives and updates. The rest of the publication covers the NP-3D, EP-3D and foreign users including Australia and New Zealand. The publication contains 102 black and white photographs and 30 detailed line drawings. 10 colour side profiles displaying different schemes worn by various Orions of differing nationalities is also included. A very eye catching scheme is that of the Imperial Iranian Air Force in its 3 tone grey lizard camouflage on the upper surface. Some photographs of the cockpit area, navigators and TACCO consoles are included. A detailed breakdown lists many of the differences that go to make up the many variants. 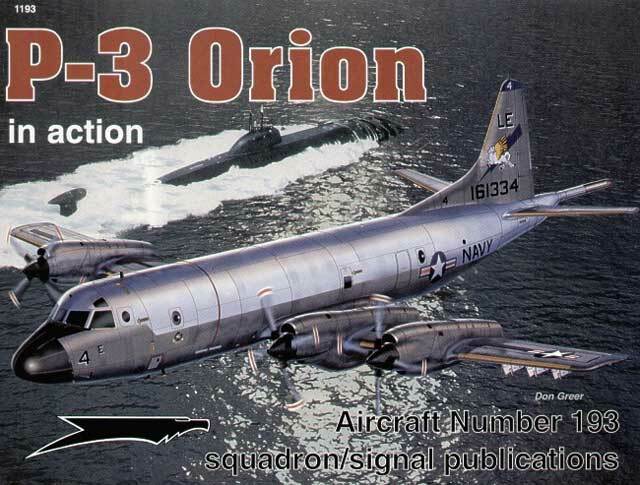 Overall this is a very concise and complete reference for any modeler wanting to build a P-3 Orion.